Well, the first reason is, if you’ve read either one of my blogs https://stalkedbyvoices.wordpress.com or https://mystalkingblog.wordpress.com, is that I’ve already been there – done that. And barring any unforeseen circumstances, I have absolutely no intention of stepping foot in the Maywood Police Station ever again. I admittedly have TRUST ISSUES and the Maywood Police are second on my NO TRUST LIST. The stalkers are number one. And there is zero chance that I’ll ever trust anything either of these two groups have to say. For example, the first time I reported the stalkers, I was the one arrested, bound over for court order out-patient psychiatric therapy and DRUGGED into submission. And secondly I want you to consider the case of George Caithamer, who was assaulted while in the custody of the Maywood Police. To read article, click here. Now this man was violated for 20 minutes and won $750,000.00. I have been violated for 23 years, and that’s not counting the years from 1976 – 1991. What do you think my judgment would be and how far do you think they’re willing to go to stop it? Personally, I like my freedom, I like being alive and I like my relatives being alive. So, I put up with the screaming every time I take a shower. I put up the verbal harassment at work. I put up with not being able to attend Church. I put up with the sick twisted sexual ‘love talk’ from a female sexual pervert. I put up with being followed every where I go just so I can have those three things. This entry was posted in My Stalking Blog and tagged George Caithamer. Bookmark the permalink. This blog is about being STALKED. Not by an ex husband, boyfriend, or girlfriend. But about being stalked by a TOTAL stranger. © 2013 The blogs elizabooks.wordpress.com and its subsidiaries, My Stalking Blog, STALKED! By Voices, Flight 404, Ruby Sanders, and A Tiny Kitten With A Big Mouth are the entire property of Eliza D. Ankum. Any unauthorized use and/or duplication of the materials contained within these blogs without the expressed and written permission from these blog's author and owner is strictly prohibited. Please contact the author at elizaebooks@yahoo.com. STALKED! 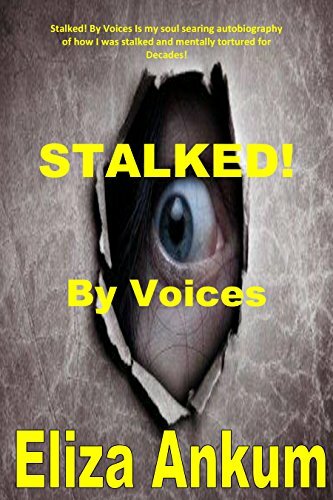 By Voices is my soul searing autobiography of how I was stalked and mentally tortured for decades.